If I were to get married today…I’d marry my husband again and then wear this ruffled flower crown, with 5 huge blooms and a lace dress. I’m loving crowns lately! If life were a fairytale I think we’d wear wedding attire everyday. I think that would be so fun. No corsets though, we gotta breath. But the headpieces! Yes! This is a little seventies and very whimsical. I hate the word whimsical, but it is, right? Since lace is so lightweight, it is really easy to ruffle it with your sewing machine without a special foot. All you have to do is turn the stitch length to the max and send the lace through. 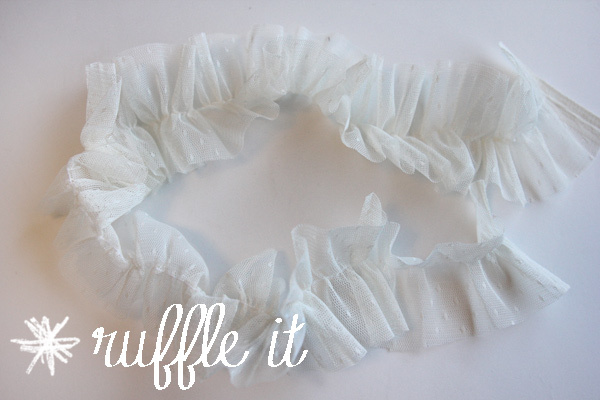 If you want it to ruffle more than that, hold your thread as the lace goes through. That will mess up the tension and cause gathers! *Make sure your iron is on low heat. To finish the headband, hot glue the felt pad to the elastic and cover it with another circle of felt. Repeat for additional blooms. Maybe this is better for more everyday wear, but it’s definitely not as exciting as a full crown of flowers! Bam! So many ruffles! See you tomorrow for another guest post and the sew-a-long tutorial! Oh, I love it Kate! Thanks for the tutorial! I’m not sure whether I’ll use it for making a crown for myself (! :P) but it’ll definitely be a great idea for styling up some tshirts and cardigans! It’s so pretty! I’m probably not brave enough (to wear the full crown but I think I could rock the single flower.